Jun'ichi Suwabe, Uki Satake, Hiroyuki Yoshino et al. All 13 episodes from the second series of the Japanese space opera series. 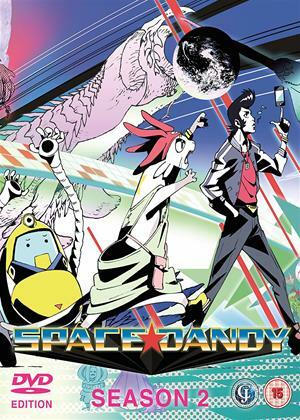 The show follows Dandy (voice of Junichi Suwabe), an easy-going but forgetful alien hunter who searches across space for new or rare alien life forms, with help from his robot assistant QT (Uki Satake) and cat-like alien Meow (Hiroyuki Yoshino). But little do the trio know, they are being pursued in their mission by Dr Gel (Unshô Ishizuka) of the Gogol Empire. The episodes are: 'I Can't Be the Only One, Baby', 'There's Music in Darkness, Baby', 'Slow and Steady Wins the Race, Baby', 'The Transfer Student is Dandy, Baby', 'The Big Fish is Huge, Baby', 'Gallant Space Gentleman, Baby', 'Rock 'n' Roll Dandy, Baby', 'A World Without Sadness, Baby', 'We're All Fools, So Let's All Dance, Baby', 'Lovers are Trendy, Baby', 'An Other-Dimensional Tale, Baby', 'Dandy's Day in Court' and 'The Never-Ending Dandy, Baby'.